Driving Hazards Brought on by Fall Weather Changes ~ E C Cooper, Inc.
It’s that time! Changing weather and shorter days can affect your daily commute. Precipitation increases as the weather cools down, bringing more rain and snow. This can lead to less grip for your tires, especially on wet leaves … and those wet leaves can be as slippery as ice. If you find yourself hydroplaning, remove your foot from the gas and grip the steering wheel tightly to calmly make steering adjustments. Don’t slam on the brakes. Hunting season is here – right now. Deer are most active between October and January, particularly during dusk and dawn. If a deer dashes in front of you, don’t swerve; this could lead to more damage. It’s better to hit a deer than hit a tree. Usually, it is less damage to you and the vehicle. 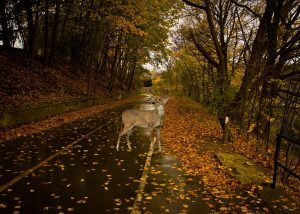 If you hit a deer, pull off the road safely to examine the vehicle. If you need to make an insurance claim, it is best to call the police and get a police report. Take photos of the damage. Days are getting shorter, making commutes darker, which is a peak time for accidents. As you are driving on your regular commute, look around for places to swerve if you need to avoid an object or animal in the road. Be mindful of back to school driving. Familiarize yourself with bus safety and school drop-off procedures. Remember! It is illegal to pass a school bus that has stopped to pick up or drop off kids. If you have any questions about your current auto insurance and what coverage is best for you, please contact one of our customer service representatives today.